This is my first go at upholstery / furniture making and I have to say I am pretty impressed with myself AND my husband who helped me sooo much! This headboard is six feet tall and 76 inches wide (a King sized headboard) It's HUGE and heavy and I love it!! This has been a project that I've wanted to tackle for a while and I am so glad I did. There is just something about making things with my own hands that gives me so much joy! Here is my new king size wing back studded headboard! I've seen all kinds of these beauties popping up on Pinterest and in stores and a lot of them run you a cool $500...at least the ones that I wanted! This project ran me around $170 so I think it was well worth the 2 days of effort to make it! Here is the break down of costs. Keep in mind that I used coupons at Michael's and Joann's Fabric for almost all of my supplies. Before you start your headboard (or even before you buy your wood) make sure you have the correct measurements. Measure from edge to edge of your bed frame. You'll want to add about 3/4 in to your measurement so that when you add your wings it will fit perfectly around your bead frame. You can get your plywood and 2x6's cut at either Lowes or Home Depot or you can do it yourself! You will need to get your 2x6 cut in half. My headboard is 6 feet tall so you may or may not want to subtract a few inches from your "wings". Once your wood is cut you will want to secure your foam to the headboard. You will have to cut your foam to fit the headboard and use a tacky spray glue to secure it. After the glue has dried for a few minutes you can now add your batting. 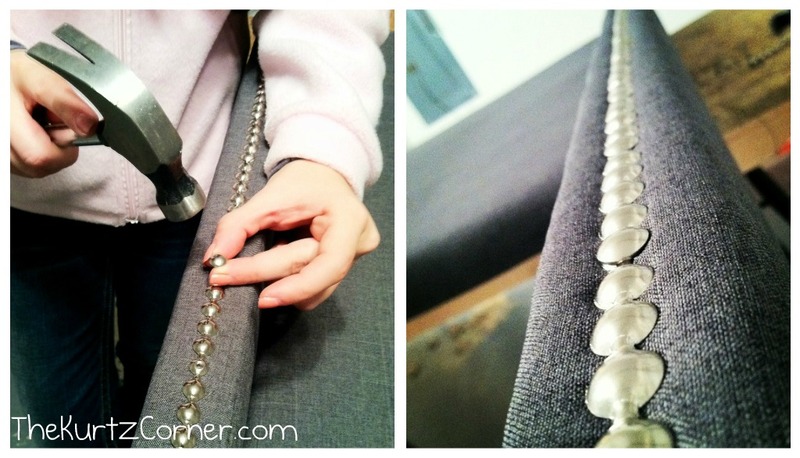 Wrap your batting around the headboard and attach it to the back with your staple gun. Be careful to not wrap too tightly so your edges are not smushed. When that is finished, begin wrapping your headboard with the fabric. You will want to cut 1 yard off of your fabric and set that aside for your wings. Be careful to not wrap too tightly and make sure there are no ripples in your fabric. My advice is to start at the top, then do the bottom and finish with the sides. Now that your headboard is wrapped you can secure your wings. Start by stapling one edge of the batting to the backside of the wings. Next, staple one edge of the fabric to the back of the wing on top of the batting. ONLY staple one end of each to the back, layering them on top of each other like we did for the headboard. This will leave you with a flap of batting and fabric that we will staple later. Once that is stapled align the top of your wing with the top of the headboard. Lift up the flap of batting and fabric and begin drilling holes through your wing into your headboard to prepare for the screws. Remember, when using a drill bit it must be smaller than the screw you plan to use. As you make you holes screw in your screws to the headboard until you have about 7 screws on each side (or until it feels secure). When both of your wings are secure wrap the additional batting and fabric around the wing and secure to the back of the wing where we originally stapled it. Your headboard and wings should now both be covered and secured to one another. 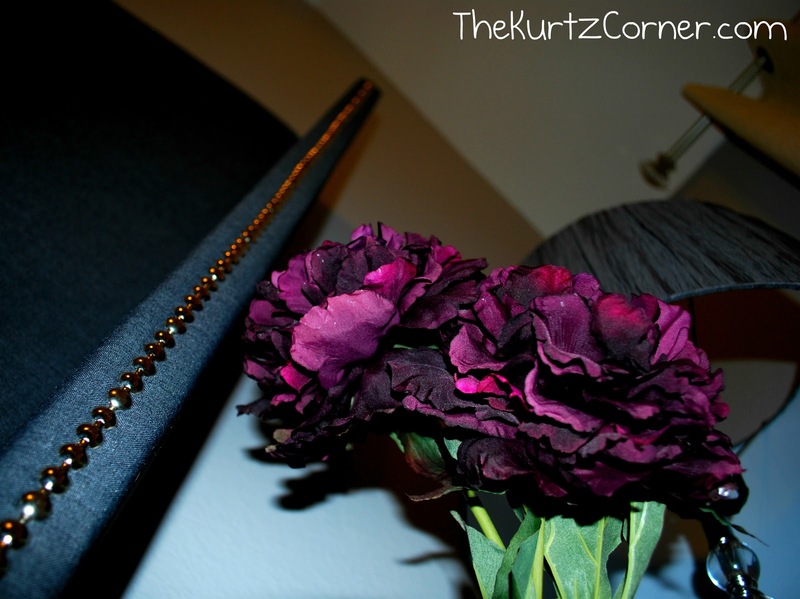 Your headboard should look something like this now...and my silly husband! 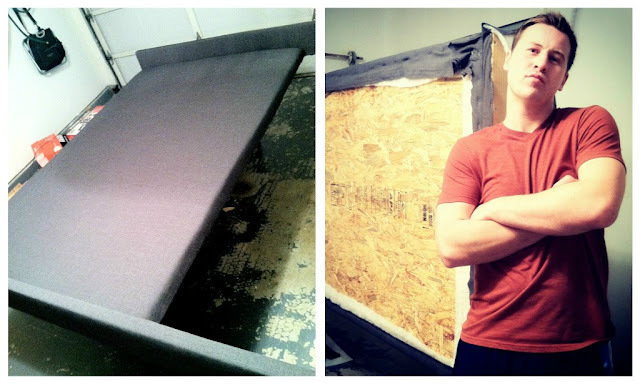 He's actually 6'4" and squatting in this picture so it gives you an idea of just how big this headboard is! It's finally time to add the studs! I love these studs because the come in a roll a keep your stud projects straight! You can find them at Joann's Fabric. Line up your studs down the center of your wing and begin to hammer into place until you reach the bottom of the front of your wing. I wrapped mine over the top...not that I can see it because I'm only 5'4" but hey lets keep it looking sharp even if I can't see it! When you are finished you can now secure your headboard to your bed frame (most have pre-drilled holes that you can use). Take a step back and admire your hard work! Below are a few picture of mine and some accents that I have slowly been adding to the room, enjoy! The finished product! I'm gonna need more pillows!! 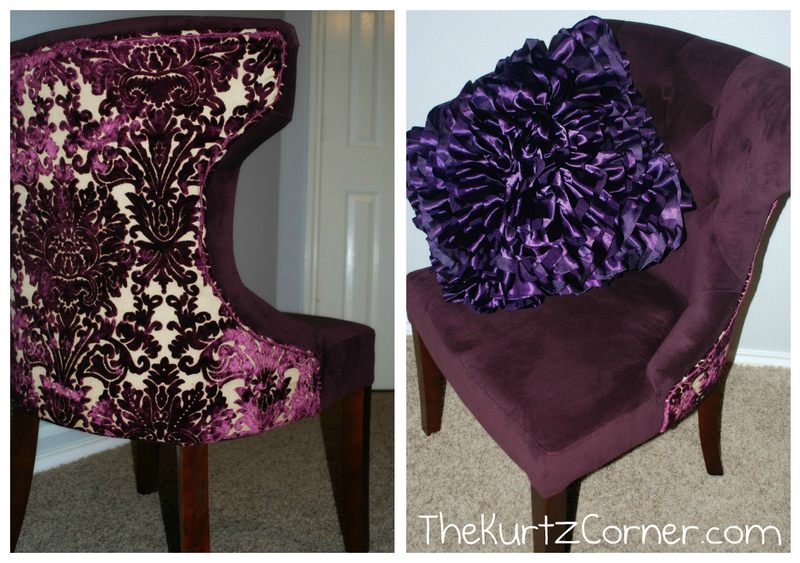 My beautiful chair that I got from Pier 1...love that store! I hope you enjoyed my headboard tutorial and that I included enough steps for you to make your own! Again, very first furniture and upholstery project so bear with me. 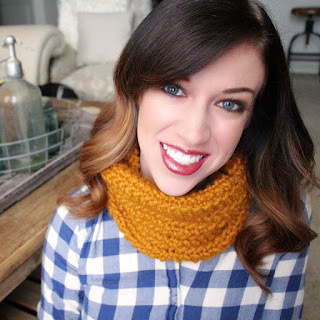 If you feel that I left out any crucial steps just ask me and I will tell you how to do it! LOOOOOOVE it!! The wings are fabulous and I adore the nailhead trim! Great job!! That looks awesome! My boyfriend and I are going to tackle building a new bed frame including head board and foot board - he is pretty ambitious! wow! looks just perfect. good for you! Oooh, pretty chairs and such a fabulous headboard! I just had a Trading Spaces flashback...we used to be such junkies for that show, but never tried anything we saw! That is beautiful! 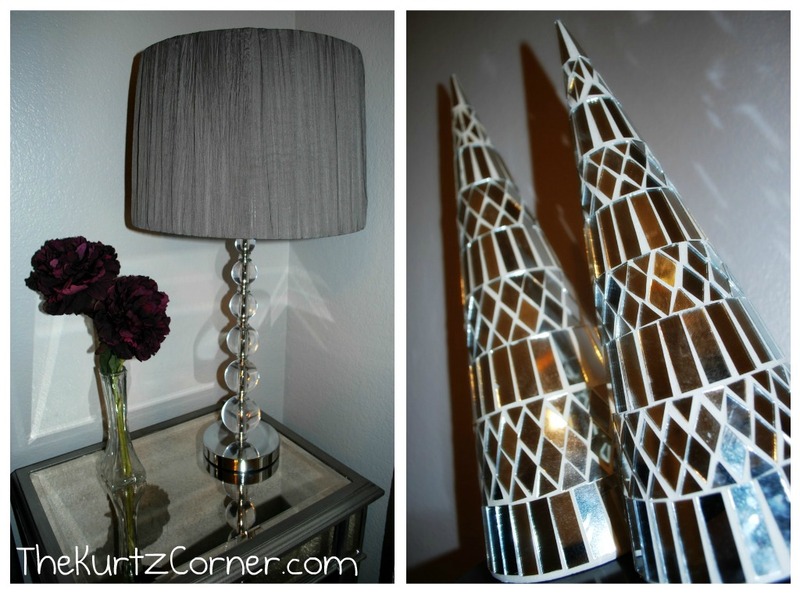 I've often wanted to add mirrored side tables to our bedroom but have never had the courage! They look great with your headboard and colors! wow! that's awesome, and great job on building that! looks awesome! Isn't it fun to get the men involved? My husband calls them "man crafts"
wow! You make it sound so easy and economic love your blog. Turned out fantastic :) Yay!!! really your job and idea is well. wow! I love how it turned out! totally pinning, sharing and stumbling it. Wow! that is awesome. good for you! Did you use a plan for this? If so can you tell me where you got it? Your bed looks great!!!! I did not use a plan...just came up with it in my head and learned as I went, sorry! The wings are the 2x6x144 cut in half and then attached to the plywood. Looks great! Congrats! What do you suggest for a thicker padded headboard? My pins are popping out! Thanks for your help in advance! Where are you putting your studs? I didnt use the thick padding on my wings, just batting so the fabric was smooth over the wood. So the studs went in perfectly.